With the weather getting colder, soups are a great choice to stay warm. They are easy to put together and makes a comforting and hearty meal on a chilly day. If you go through the blog, you can see there aren't much soup recipes. Why? Because I'm not really a soup person but my hubby loves soups. So I'm trying out few soup recipes once in a while. Have a look at the sweet corn soup and spiced carrot-ginger soup I posted sometime back. As I said, soups are really quick and easy to make and you just need few slices of bread to serve along. Cream of mushroom soup is a simple and delicious soup which does not involve any grinding. The thickening agent for this soup is basic roux thinned with milk. I slightly adapted from this recipe and adjusted according to our taste. I used shallots in the recipe as I love the slight hint of sweetness. You can use regular onions too. 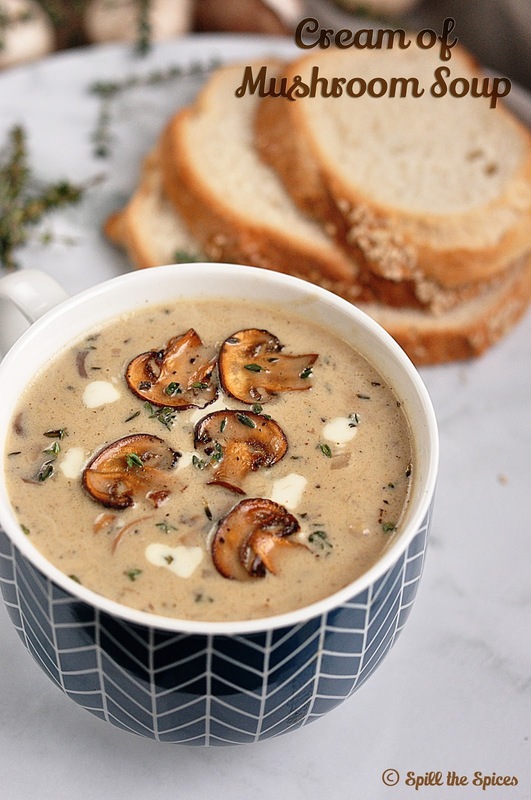 I have tried the soup with parsley and coriander, but I prefer thyme as it pairs well with mushrooms and adds more flavor to the soup. 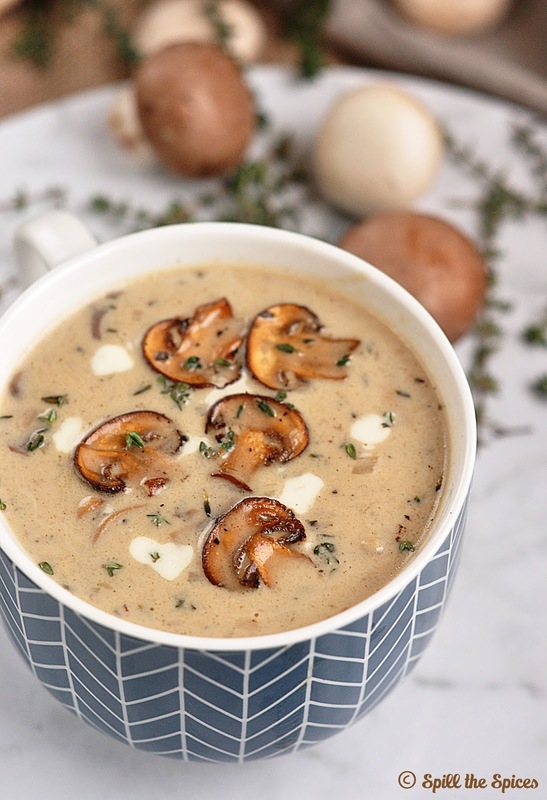 Even if you are not a fan of mushrooms, I'm sure you would love this soup. Off to the recipe. 1. Heat a saucepan/pot and add olive oil, butter and bay leaf. Once butter melts, add garlic, shallots and saute till they are soft. 2. Turn the heat to high and add the mushrooms. Saute the mushrooms until they turn light brown and all the water has evaporated. 3. Turn the heat to medium-low and add thyme, nutmeg, salt, pepper and mix well. Add the flour and saute for 3-4 minutes. 4. Add the milk, vegetable stock to the mushrooms and cook till the soup starts to thicken. 5. Once the soup has thickened, stir in the cream and cook for 1 minute. Remove from heat and serve hot. Do not add salt while frying the mushrooms. Do not add more nutmeg as it can over power the flavor of the soup. Instead of vegetable stock, you can use water or milk. If you want a low-fat option, you can skip the cream. Thyme goes well with mushrooms, but you can use other herbs like parsley or coriander. Delicious comforting bowl of soup...Loved that bowl too! 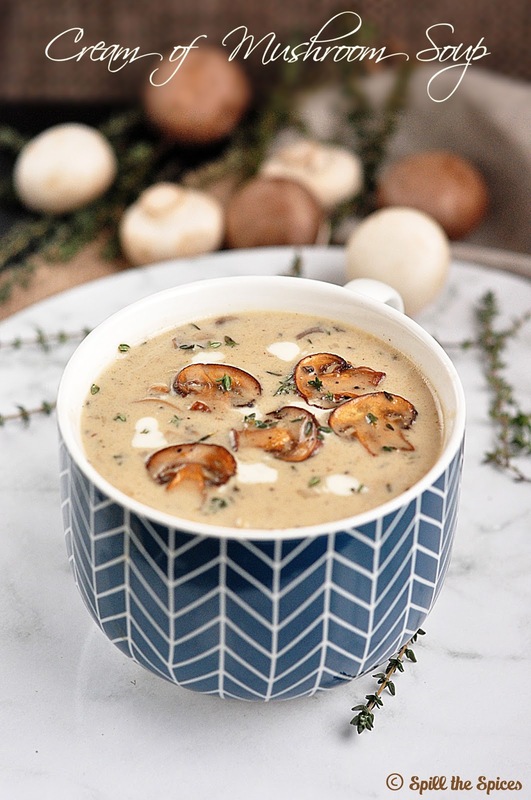 One of my favorite soups, looks so delicious..